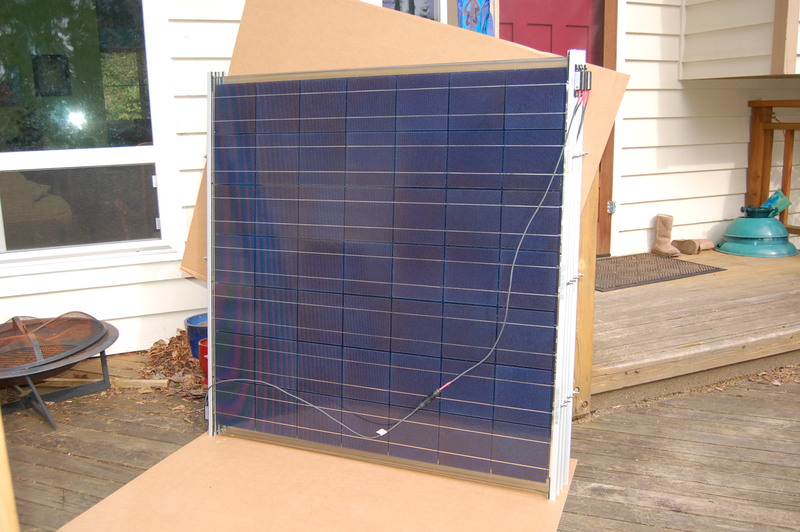 As some of you may have gathered by the We’ve Got the Power post by Sandy, we have finally taken the plunge into solar power / photovoltaic (PV) generation. 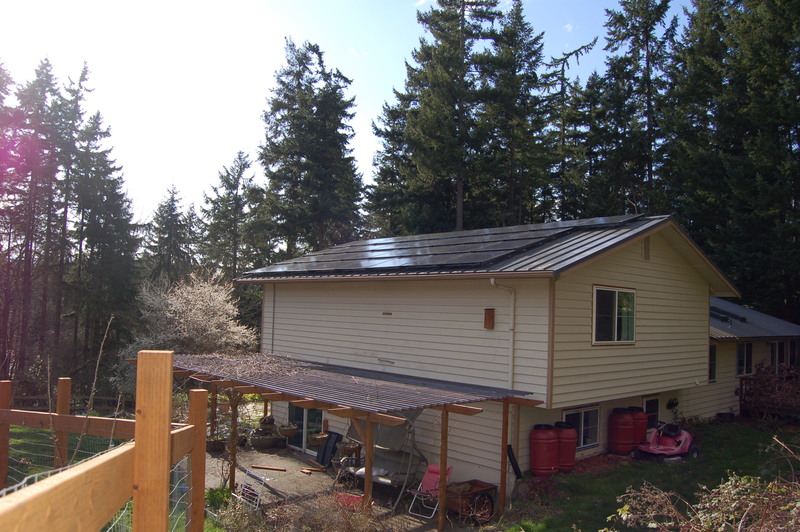 We have been wanting to install a PV array on our roof for several years, and have been actively planning for it for about 4 years, including installing a metal standing-seam roof and cutting down a beautiful, but shade-producing maple tree. 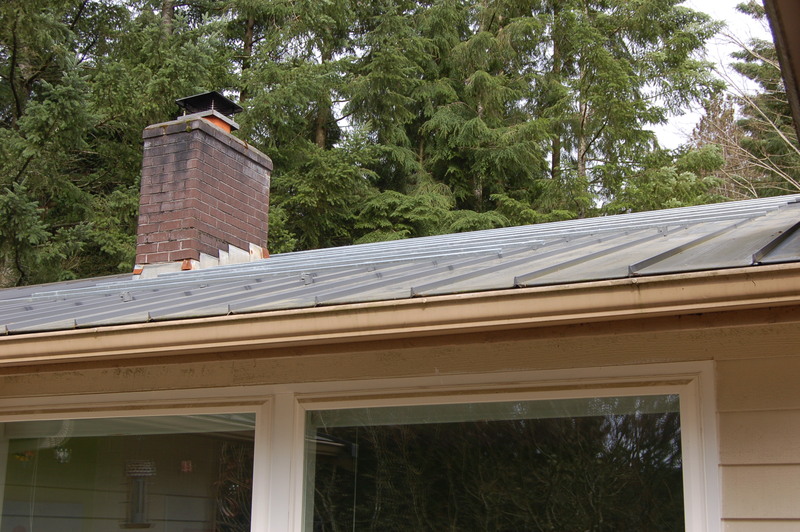 The primary array is on the section of our roof that faces south by southeast, while the smaller secondary array faces southwest. 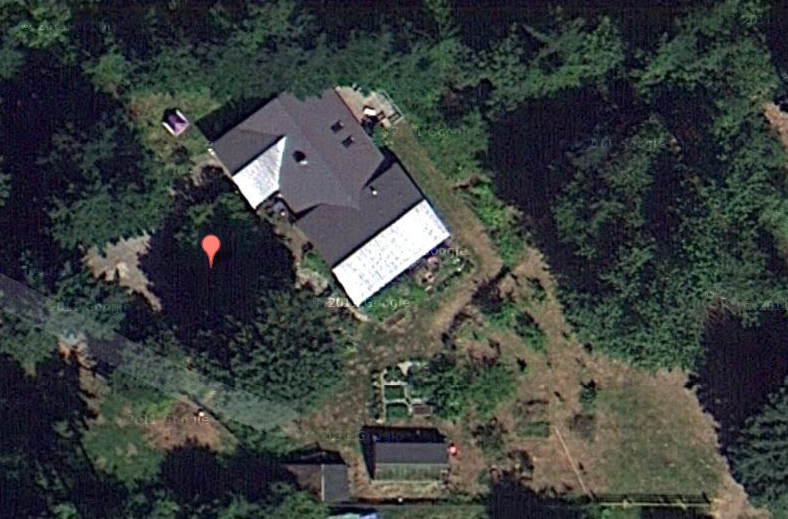 As seen in the Google satellite photo below, the large section of roof that is reflecting light back up into space gets a lot of sun and was therefore the optimum site for the primary array. This also indicated that we could boost the coverage to over 80% by convincing our neighbor to chop down some poplar trees that lean towards our house…needless to say, this is a future plan (if we can bribe them sufficiently). The secondary array has a similar shading / orientation factor, with an average factor for the two arrays of 73.5%. The feasibility having been established, we now needed to decide upon what modules we wished to install. The biggest decision you need to make in Washington State is whether or not you want to use local (WA) produced panels, or ‘foreign’ panels (e.g. produced outside the borders of Washington State). 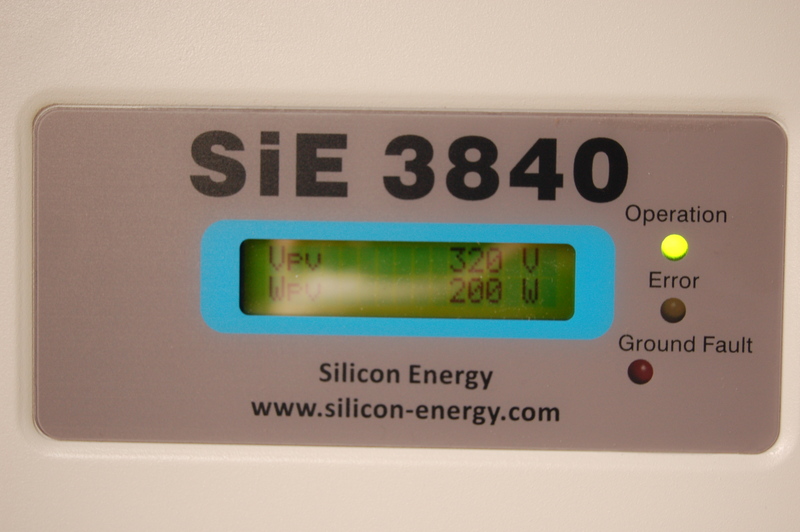 The differences are not trivial: for example, panels from Sanyo have the highest power density (highest efficiency) but you only get an incentive rate (a rebate for energy produced in kiloWatt Hours) of $0.15 / kWH as they are non-locally produced, while panels from Itek Energy or Silicon Energy (SiE) are less efficient (you need more panels to produce the same amount of wattage) but receive the maximum incentive rate of $0.54 / kWH. In addition, the panels from Silicon Energy are the only panels that have survived the DOE accelerated aging tests (80 years and counting) without a failure. 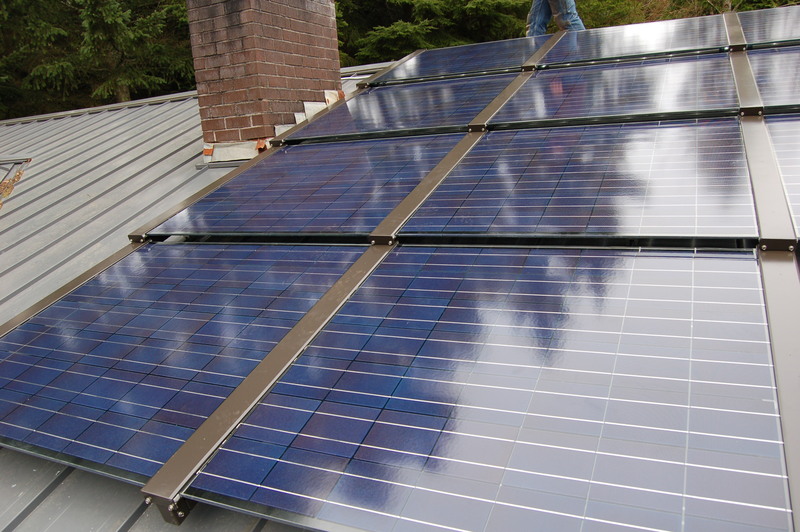 After much back and forth, we decided to go with the Silicon Energy panels as they would allow a quicker payoff / break-even than the Sanyo panels, despite the higher initial cost, as well as the fact that we would be supporting a local Washington business and Washington jobs with our purchase. After some juggling of configurations by Will, we decided on a final configuration of a primary array of 33 SiE panels facing SSE running through a large inverter, and a secondary array of 12 panels facing SW running through a smaller inverter. 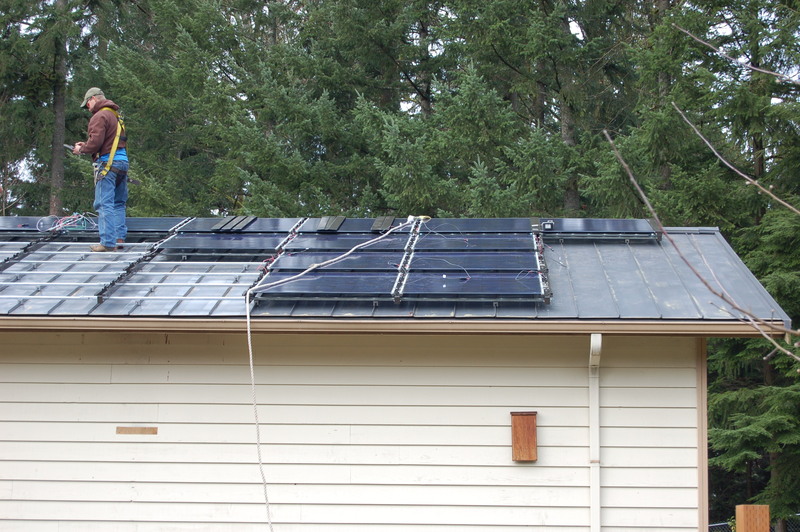 The heart of the system is, of course, the photovoltaic panels. These miracles of science convert solar radiation (remember, light is both a wave and a particle) into electricity. While nowhere near as efficient as photosynthesis, it is still pretty impressive that these panels are able to capture close to 20% of the energy from the sun and harvest it. The panels we chose were 195W units, which provide a theoretical maximum output of 8.775kW if all 45 panels are running at 100% efficiency. 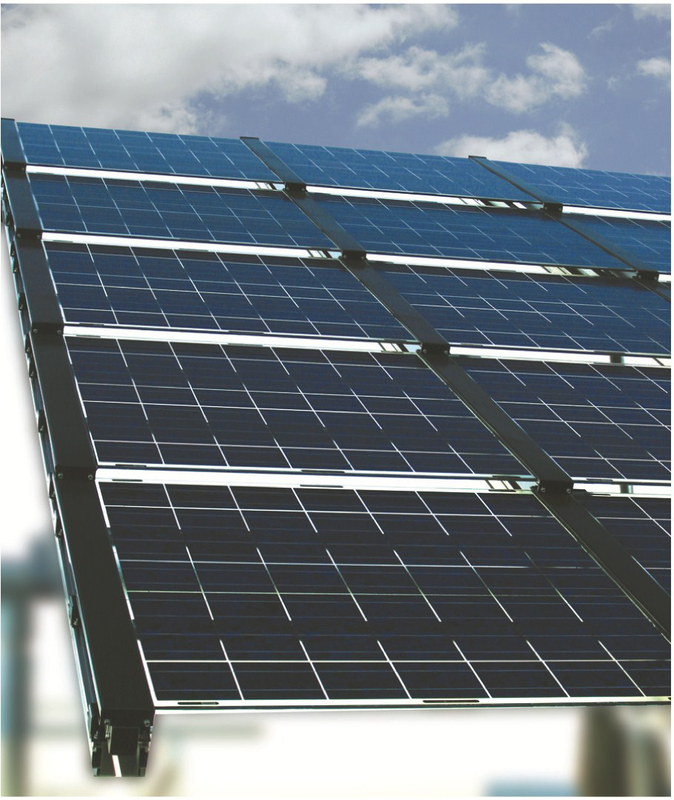 Once the panels have generated electricity, it needs to be converted from direct current (DC) to standard 240VAC at 60Hz – this is done with inverters. 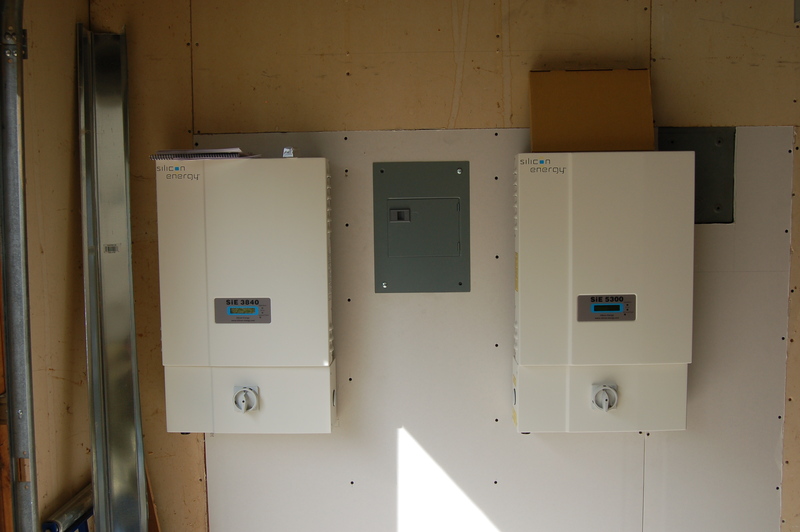 Because we have two banks of panels, we needed two inverters: one rated at 5300W and one rated at 3850W. 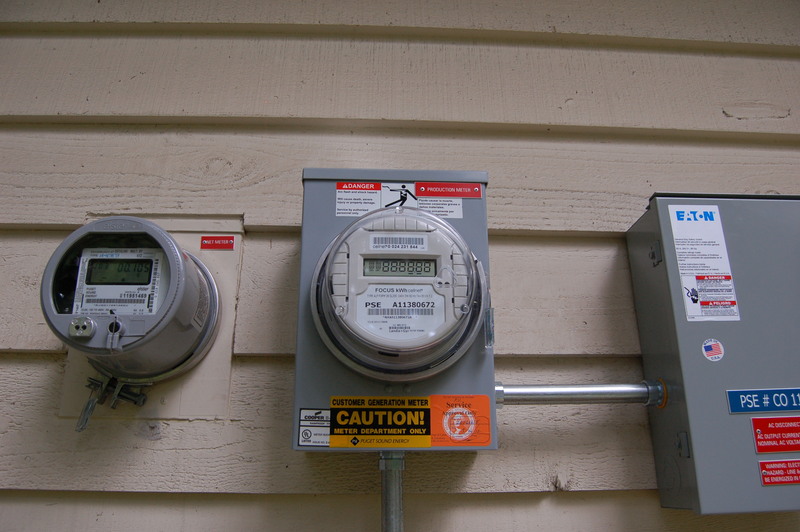 These panels then run through a series of breakers (safety, safety) and a massive cutoff switch to a pair of meters – one that measures the total production in kWH (for the $0.54 incentive payment calculation) and one that measures net consumption (e.g. house consumption minus PV production). 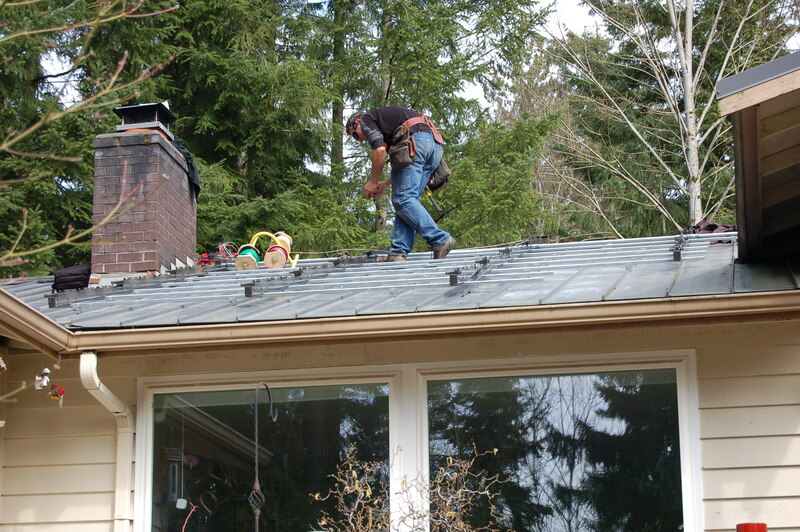 The installation started on a cloudy Monday – the PSS crew’s first task (which took the entire day due to the fact that the seams on our roof were 11.5″ on center instead of 12″ on center), was to install the rails upon the roof that would support the panels. The non-standard spacing would force the crew to drill out almost all of the holes instead of using the pre-drilled holes. Needless to say, they were a bit displeased by this discovery but they worked through it and made the best of the situation. 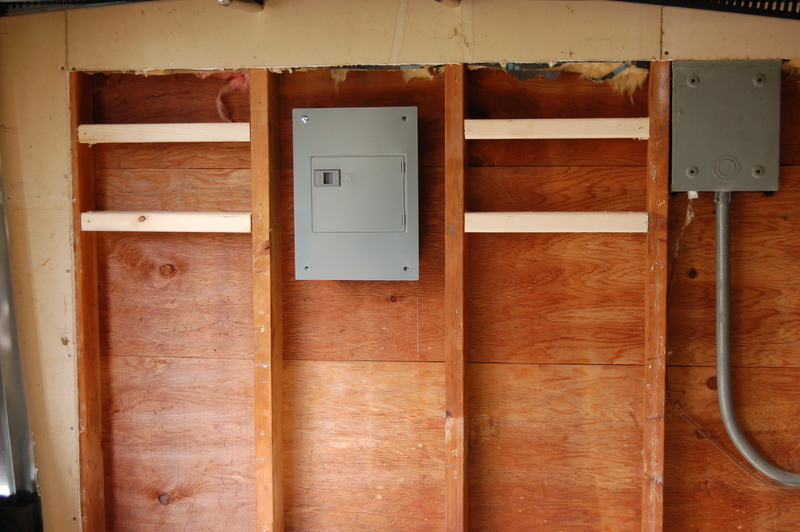 On day two, the electricians came out and began the prep work to install the inverters and the high-voltage home runs from the inverters to the panels. 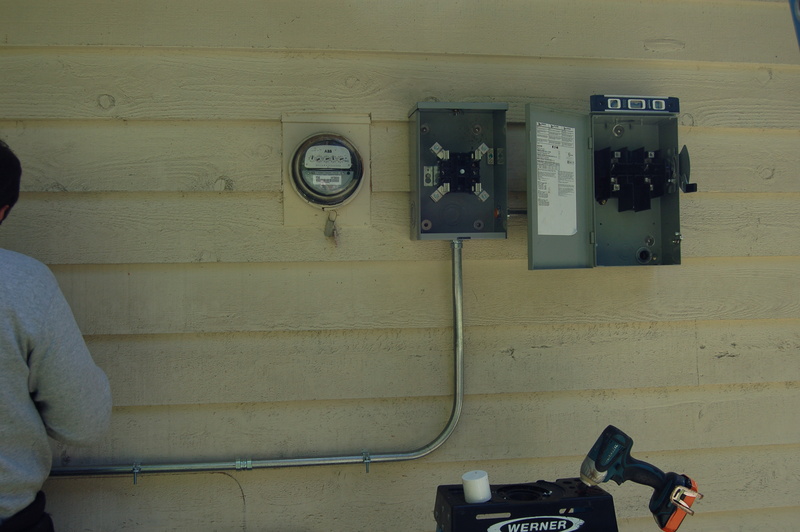 Note the breaker box between the planned inverter location – this is one of three cutoffs (not including the off/on switch on the inverters themselves) that can be used to disconnect the solar panels from the incoming line voltage. 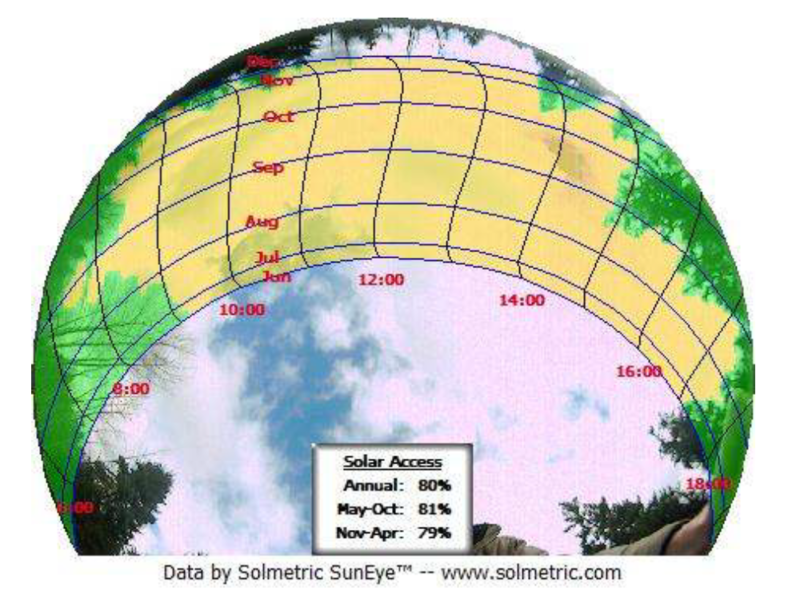 This entry was posted in Solar and tagged inverters, net metering, Puget Sound Solar, PV, Silicon Energy, Solar, solar installation, solar panels. Bookmark the permalink. Very interesting Derek! Kind of fascinating actually. You both have worked and planned so hard for this. Congratulations!